♣ Package Includes: 1*ABS CR8 device + 1*ABS CR8 gel pad + 6*Abs Fit gel sheets + 1*Support belt + 1*Clear case + 1*Opener + 1*Lithium button battery CR2032 + 1*Instruction Manual. ♣ EMS Stimulation: EMS is a technology that sends Signals directly to muscles by microelectric stimulation and exercises the muscles. It has been used in exercise for long time. There are 20 levels of intensity, 9 modes of fitness. ♣ Efficient training: For efficient training, it will automatically switch somatosensory. the whole process(warmup – take exercise – relax) about 15 minutes. The 15-minute training program to tone and firm your muscles. ♣ Exercise on your daily routine: Use the FITPAD trainer while reading, taking care of household chores, on business trips or even off on holidays.You can shape a perfect body without toilsome traditional exercise. ♣ Environment friendly material: With soft PU gel pad, is follows your body contours to deliver the most efficient workout of your targeted body area, and silver contact surfaces for uniform conductivity, as well as Japan imported gel which is odorless and anti-allergic, it will be your best choice to exercise. 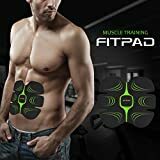 FITPAD Wearable training gear follows your body contours to deliver the most efficie nt workout of your targeted body area, for a stronger, more beautiful body. EMS (Electric Muscle Stimulation) is a technology that sends Signals directly to muscles by microelectric stimulation and exercises the muscles. It has long been used in sport and fitness, Safe and Stable, it will help you achieve a powerful, elegant and attractive body. The 15-minute training program to tone and firm your muscles.For efficient training, it will automatically switch somatosensory. the whole process about 15 minutes. Light, Ultra thin, Portable, Comfortable to wear.It can be worn unobtrusively under your clothes, making it easy for workouts even while you’re at work or on the move. Come with CR2032, enough for about 28 times of using, no need to get it charged frequently. CR2032 for replacement. Let it exercise your muscles to help you achieve an even more beautiful physique.